Add a stylish and casual dining setting to your home with this solid wood counter height table. The storage that this table provides helps to set it apart from a more standard table. The top shelf allows for easy access to dishes, or even as a display for some decorations in your dining room, while the two sliding barn doors in the center of the table open to reveal plenty of hidden storage. 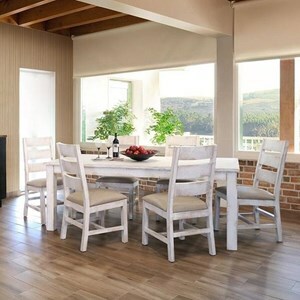 The rubbed-white finish of the table body is perfectly compliments by the brown table top. The weathered look of this piece, along with the metal accents from the sliding barn doors give this a charming rustic look and feel. The Pueblo Rustic Solid Wood Counter Height Table with 2 Doors by International Furniture Direct at Furniture Superstore - Rochester, MN in the Rochester, Southern Minnesota area. Product availability may vary. Contact us for the most current availability on this product.